Switching to single-use systems can have financial and performance benefits. However, one critical challenge for complete acceptance of single-use systems is assurance of bag integrity — and in turn, product sterility and operator safety. The main risk with single-use technology is associated with leaks that can be induced by transport and handling (1). The second greatest concern regarding the use of disposables is bag breakage and related loss of production materials (2). Pressure decay is the most commonly used integrity test method for flexible containers. A test bag is filled with high-pressure gas. Then the test part is isolated from the gas supply, and after a stabilizing period, its internal pressure is monitored over time. The pressure drop (Δp) is measured in the time (Δt). 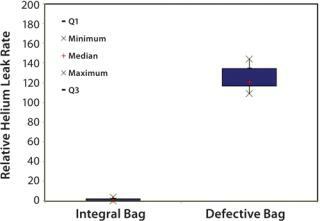 Independent third-party laboratories performing bacterial challenge testing on single-use bags have concluded that bacterial ingress can occur through pinholes as small as 15 µm, whereas pinholes ≤10 µm present little or no risk of sterility breach. 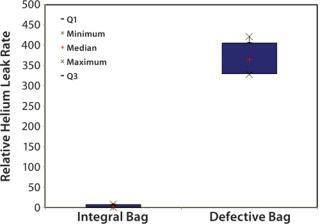 Conventional whole-bag pressure-decay integrity testing is typically sensitive enough to detect pinholes only down to ~90 µm. ATMI LifeSciences has developed a helium-based integrity testing system to help ensure the highest possible confidence in its single-use systems. This platform includes a controller and bag holder that are placed in a vacuum test chamber. The single-use bag and its manifolds to be tested are placed into the vacuum chamber and connected to service hoses. When the chamber lid is closed, it guarantees a helium leak-tight seal. The test chamber and unit are then evacuated to create a vacuum, and the bag is pressurized with helium gas. The helium-filled single-use assembly is then held for a fixed time while surrounding vacuum is monitored for leaking helium using a sensitive mass spectrometer. ATMI HIT technology has been validated for reliable detection of pinholes as small as 10 µm, even in the context of an in-process whole-bag product release test (Figures 1 and 2). Further visual inspection of the connectors showed that the helium leak rate was instantly detected by the HIT system. The platform is capable of detecting missing or half-closed connectors and components, even for cases in which pressure-decay tests cannot. The HIT system is now available for implementation at end-user facilities. The equipment can be configured for testing virtually any single-use assembly up to a 300-L 3D bioprocess vessel, mixing bag, or bioreactor bag. Upgrades to support testing of bags up to 1,200 L in size are in development. Carla Conant is global product manager for ATMI, 10851 Louisiana Avenue South, Bloomington, MN 55438; 1-952-944-4783; cconant@atmi.com, www.atmi-lifesciences.com. 1.) Wassard, KH, and H Schubert. 2012.ABSA Orlando. 2.) Langer, E 2009.Pharma Manufacturing.